This is another recipe from my Cat Cora cookbook. Jordan and I love this pasta dish. It's easy to make, delicious, and super cheap! We're talking less than $6 for the whole dish. Read: not per serving. Six dollars for the entire pasta dish that yields 6-8 servings. Added bonus: this is a healthy meal! *I added the mini tomatoes just to my dish. Jordan hates them, so don't think the tomatoes are a necessary addition, because they are 100% optional. Fill a large pot with water, add 2 t. salt, and bring to a boil. While the water is heating, cut the cauliflower florets away from the core. Add to boiling water and cook until fork tender, 5-7 minutes. (I just spear them with a fork, and when the fork goes easily in and out, they're done.) *Do not drain the water! 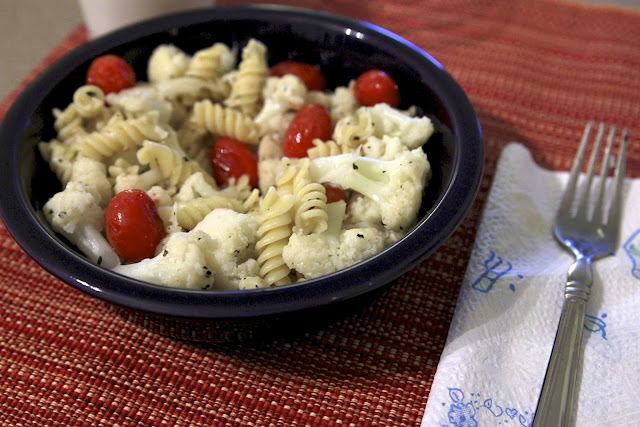 You will be using the same cauliflower water to cook your pasta. Just bring the water back to a boil and cook the pasta until al dente. While the cauliflower is cooking, heat a larget skillet with the olive oil. Then, remove the cooked cauliflower to the skillet with a slotted spoon and break into bite-sized pieces. Cook until the florets begin to brown. Add the garlic and cook for another 2 minutes--until the garlic starts to brown. When the pasta is done, drain and reserve 1 cup of the pasta water. Add the pasta, cauliflower, and garlic to the pot and toss. Add the red pepper, basil, salt, and black pepper. Then, add the cheese and toss again. If the pasta doesn't look saucy enough, add some of the pasta water. Toss and serve. This is not going to be a "saucy" pasta like you are used to, but the garlic and pepper give it a delicious flavor. You can cook some mini tomatoes in a small skillet with olive oil and kosher salt and add to the dish for more flavor, but it is not necessary. This makes enough for Jordan and I to eat our full for dinner and have enough for at least 2 more meals of leftovers. YUM!! I would have never thought to put this together. It looks delish! My husband wouldn't be happy if I made this for dinner one night but I think I'm going to anyways, this looks yummy! I like the curly pasta too! I love cauliflower. This is a great dish! Yum!!! 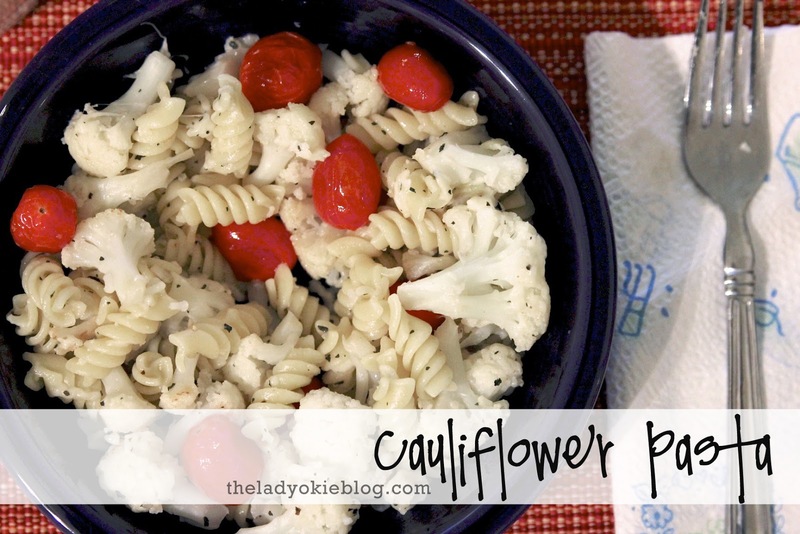 I love cauliflower ( and healthy recipes!). I can't wait to try making this!